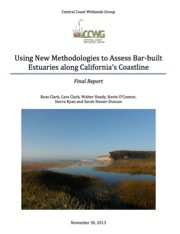 The Lower Gabilan Watershed has been a focus area for staff at CCWG for well over a decade. This area encompasses a large range of landuse including: urban development in Salinas and Castroville; agriculture, particularly intensive row crops such as strawberries and leafy greens; natural wetlands and open space, which used to dominate the landscape but are now found only in fragments. This area is also home to some of the most polluted waterbodies in the state. Tembladero Slough, for example, is listed for 14 TMDL pollutants. We see a lot of potential for improving water quality, adding valuable habitat for wildlife, and providing community access to open space. This can be done without compromising the productivity of the region or the safety of the food grown here. For more information on how we are addressing improved coordination and the implementation of projects in the lower Gabilan, please see our projects. 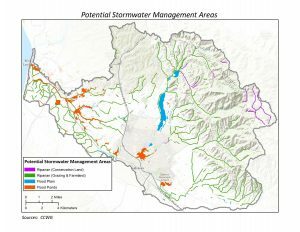 The project will create a new, watershed-based SWRP for the Greater Monterey County IRWM Region that will meet all requirements of Water Code §10560 et seq. and SWRP Guidelines. The lead applicant is Coastal Conservation and Research, Inc. a nonprofit organization. The plan will be developed on behalf of the Monterey County Resource Management Agency, which administers the Phase II NPDES permit for unincorporated urbanized areas. 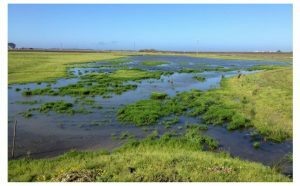 Watershed boundaries include the Salinas River (within Monterey County, 2,490 sq mi) and Alisal-Elkhorn Sloughs watersheds (232 sq mi). 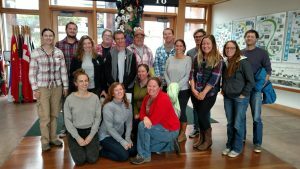 The project will include metrics-based quantitative analyses of hydrologic, topographic, and environmental conditions and opportunities, which will provide a framework for identifying and evaluating implementation projects to include in the SWRP. The resulting SWRP will describe and prioritize multi-benefit implementation projects to achieve water supply, water quality, flood control, environment, and community objectives. One important effort that CCWG has coordinated is the Water Resource Project Coordination (WRPC) process. 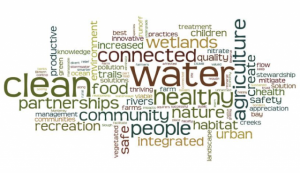 The WRPC process represents an innovative approach through the Integrated Regional Water Management Plan (IRWMP) aimed at addressing and resolving water-related conflicts in the region, while promoting stakeholder collaboration and project integration. The goal of the WRPC process was to alleviate areas of mistrust and confusion and increase collaborative dialogue so that mutual solutions could be achieved. The Gabilan Watershed was selected as the focus area for this pilot project, as a majority of Monterey County projects were proposed there. A series of facilitated stakeholder meetings followed. 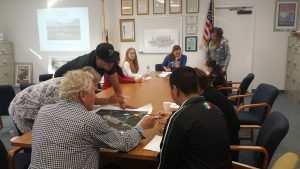 A decision was made to focus on identifying “shared values” in the Gabilan Watershed rather than moving directly to trying to find solutions to areas of disagreement. The stakeholder meeting in January 2013 began with the participants anonymously sharing their understanding of the challenges facing the region. In this way the “elephants in the room” were brought out into the open without individuals needing to self-identify as proponents or opponents. Then participants were divided into “affinity groups,” including agriculture, research, conservation, and government. Each group was asked to discuss amongst themselves their priorities for the watershed. Each participant was asked to create a visual image of their “desired future” for the watershed, its characteristics, and what they saw to be the key obstacles and opportunities for success. Finally, the discussion was turned to solutions. From the groups’ images and discussion, it became clear that there was actually more common ground amongst stakeholders than anticipated.